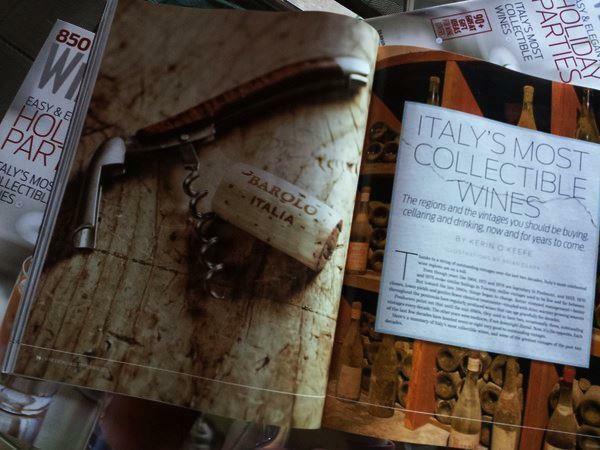 In the December 1 issue of the Wine Enthusiast, Kerin O’Keefe published an article called Italy’s Most Collectible Wines. Focusing exclusively on red wines, she surveyed the last approximately 20 years, singling out the best vintages and producers for each of her chosen great denominations – Barolo, Barbaresco, Amarone, Brunello, Bolgheri, and Taurasi – and offering a single exemplary bottle for each vintage. Given the ever-irksome space limitations of print publication, which are immensely burdensome to any writer with something to say, she did a great job with so potentially huge and shapeless a subject. 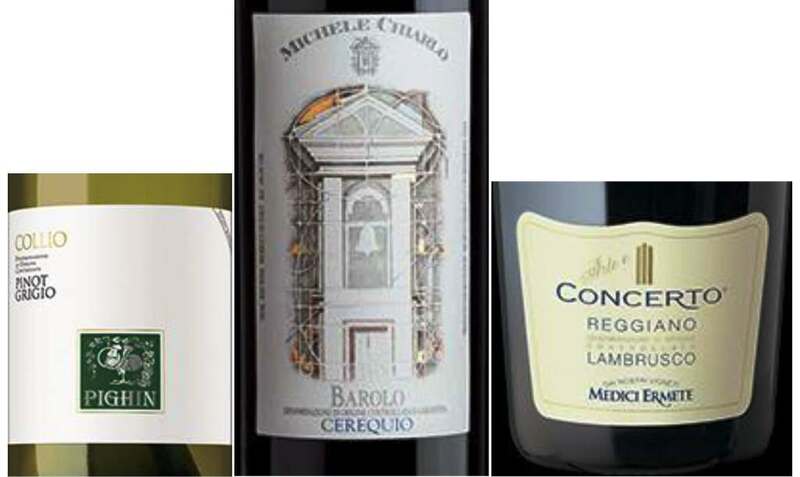 Very few American wine writers – very few writers in English, in fact – know Italian wines as well as KO’K, and she nailed the important vintages exactly for each of her wines. No one – not even a notorious carper like me – could find fault with her chosen examples either. I wish she had had room for more individual producers’ names, and I’d bet KO’K does too – that’s where those space limitations really hurt. “Here’s your assignment: Tell us all about the great vintages and producers of Barolo (don’t forget to explain what Barolo is) in 250 words.” As the immortal Alfred E. Neuman was wont to say, Aaaarrrrggghhh! 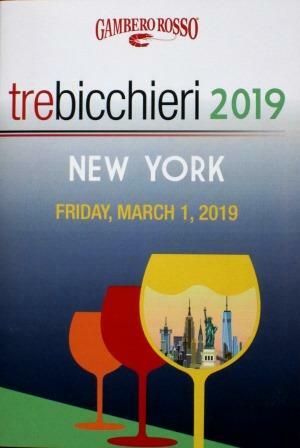 My only serious quibble with this list is with Bolgheri and its profusion of French varieties, of all of which I am far less a fan than the vast majority of wine journalists – though I am pleased to see the inclusion of the first-rate winemaker Michele Satta. I would rather have used the limited space available for a few off-the-beaten-track great wines – some Gattinaras or Caremas, for example, or Chianti Rufina, especially Selvapiana, or Sicily’s Palari or some Etna wines. But this is a small area of disagreement with a very authoritative listing of Italy’s red crème de la crème – if that isn’t too repulsive a metaphor for what is meant to be high praise. A pair of provocative articles, published recently by a pair of old pros whose work I respect and admire, Alfonso Cevola and Matt Kramer, questioned the value of cellaring wines nowadays. 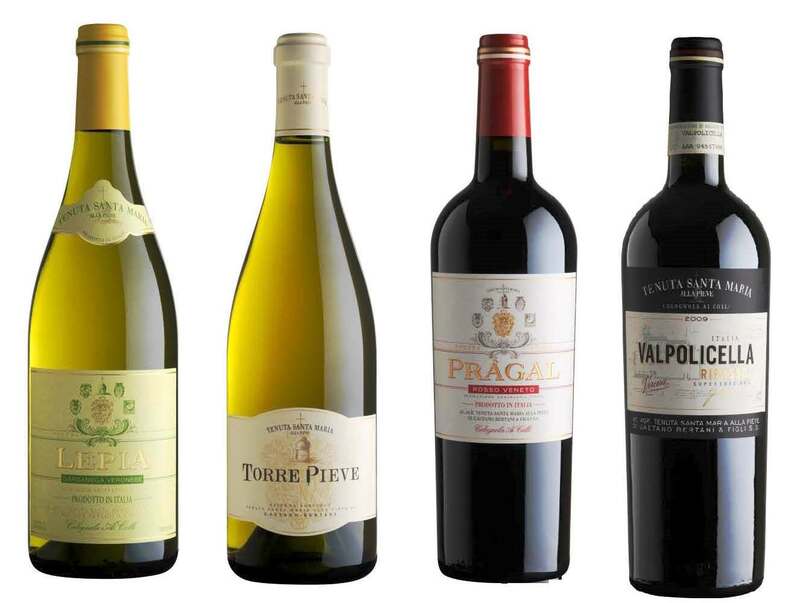 As one who dotes on the taste and complexity of mature wines, I was naturally intrigued by their consideration of the pros and cons – largely cons, it seems – of aging wines. In recent years it’s become obvious that an ever greater number of wines that once absolutely required extended aging no longer do. Simply put, most of today’s fine wines—not all, mind you—will reach a point of diminishing returns on aging after as few as five years of additional cellaring after release. Stretch that to a full 10 years of additional aging and I daresay you will have embraced fully 99 percent of all the world’s wines, never mind how renowned or expensive. My hard-won experience with aging wines has now answered to my satisfaction the question about the absolute need for long aging; namely, that the great majority of wines today, in the great majority of vintages, don’t really reward that “expensive” extra five or ten years beyond the five or ten years of aging you’ve already bestowed. I am now convinced that today’s wine lover is well advised to buy fine wines, cellar them in a cool space for five years—ten years, tops—and then drink them in secure confidence that the great majority of their full-dimensional goodness is available to you. After that, it’s all just fantasy—and the very real likelihood of an increasingly diminishing return on your already delayed gratification. To this argument, Alfonso adds a stress on the subjective side: We too have changed. Our palates have changed – we want younger, fresher wines now – and we want to drink different wines than the kinds we stored away years ago. I go into my little walk-in closet and look at all the things I thought would be important to drink in 10-20-30 years and I often find myself walking out and going to another rack of newer wines; fresher, lighter, unencumbered by the dust of time. Oops. In looking over my little tribe of wines that huddle together in the closet, there are all kinds of strange bedfellows. What are all those sweet wines doing in there? Will it ever get cold enough to drink all the Port that has been gathered? Are those Super Tuscans really prettier when they age, or were they at their best when they were young and willing and tight and bright? A lot of this is incontrovertible. Our palates and our desires do change over time. Not all wines, even under the best cellar conditions, cooperate by aging and maturing in an interesting manner. And winemaking most certainly has changed, and very dramatically, in ways that must have an effect on the age-ability of wines. For instance: I recently tasted a very large number of classified growths of Bordeaux, vintage 2010, and found myself vastly underwhelmed. This is a vintage that Parker and others have hailed as great: I believe the Bordelais consider it the third “vintage of the century” so far in this young century. It is already remarkably accessible, compared to the initially tough but long-aging Bordeaux vintages of half a century ago, on which I learned my vinous ABCs. Parker and others think 2010 will be very long-lived, because it has big tannins, lots of acidity, and pretty high alcohol (at least compared to vintages such 1955 and ’59, ’61 and ’62, ’64 and ’66 – my vinous elementary and high school). Frankly, Scarlett, I don’t give a damn whether 2010 Bordeaux ages well or not: I found most of the wines I tasted unbalanced and unintegrated (leading me to think that in fact they won’t age well) and – most damning for Bordeaux – inelegant, bordering on vulgar. These wines certainly show the effects of the green harvest that Matt talked about, and in a thoroughly deleterious fashion: not wines I’d want to keep around at all. Maybe for many wines ripeness isn’t all? Maybe – for Cabernet sauvignon especially – ripeness can easily be overdone, and a little under-ripeness, with consequently initially tougher tannins and higher acidity and a lot less forward fruit, can be better? Vinous heresy for sure, and be careful who you say it to, lest you be declared pariah and driven out of your tasting club. I’d certainly agree that there are many occasions on which I actively desire a younger, fresher wine. But that hardly means that there aren’t times when only a mature wine will do what has to be done: charm, seduce, overwhelm, overflow our sensory apparatus and our store of synonyms for great. I’ve been putting wines away as long as Matt has. 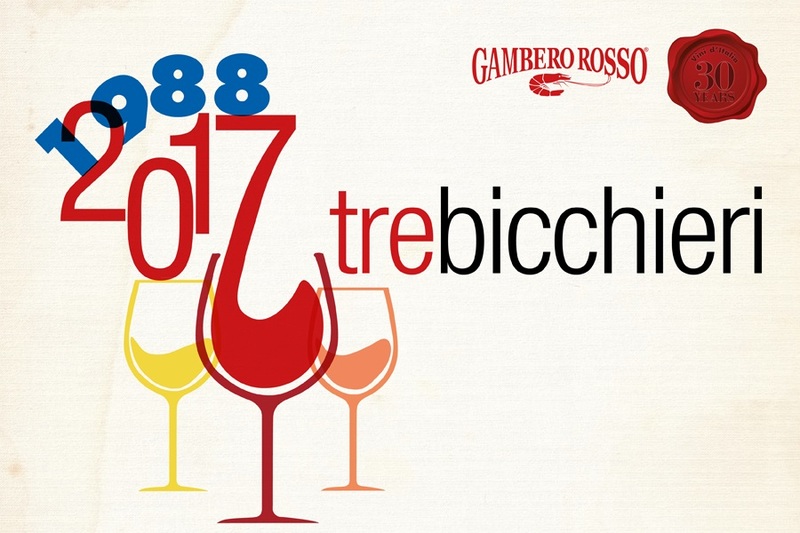 Many are from the ‘90s and before, but also with a healthy selection from the first decade of this century (especially from Burgundy and the Piedmont, the Veneto and Campania). Yes, over the years, a few bottles have disappointed, but many have been glorious – and the ones I cellared in the 1990s are doing just fine, thank you. I have equally high hopes for my wines from the first decade of this century: I just hope I’m still around to enjoy them. A few weeks ago, Diane and I shared a celebratory meal with old friends Betty and Livio at Danny Meyer’s Roman-style restaurant Maialino. 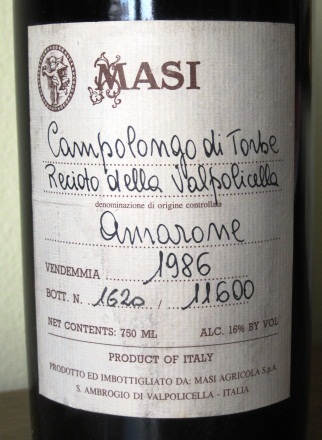 To mark the occasion – two of us were turning 75 – I brought a 1986 Masi Amarone Campolongo di Torbe, which we decanted as soon as we were seated and drank about an hour later. I’m not even going to try to describe it, because its complexity was so great and so steadily evolving through the meal. It was, simply, a one-bottle proof of the wisdom of cellaring wine. I only wish I had more of it, and that I might live long enough to experience it at its peak. People do change, and wines do change – and many times, both are for the better. There are still many kinds of wine that respond very well indeed to aging. Whether the 2010 bottles of Bordeaux will last 20 or 30 years, I doubt, and I’m not going to be around to find out – but I’m willing to bet that a large number of recent vintage Châteauneuf du Papes will, and an equally high percentage of Barolo and Barbaresco (Conterno and Mascarello are shoo-ins), Amarone and Aglianicos and even a few Sangioveses (Biondi-Santi! and Selvapiana’s Chianti Rufina Riserva Bucerchiale). I’m probably not going to cellar any of them myself, but that’s a decision based on the actuarial tables, not the quality of the wine. 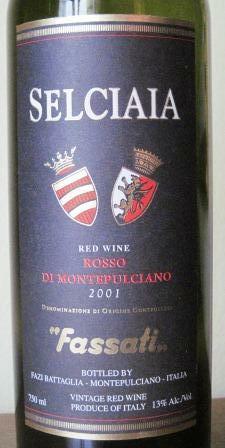 Yesterday I opened a bottle that I had lost track of, 2001 Selciaia, a simple Rosso di Montepulciano from Fassati. I never meant to keep it so long, and I didn’t know what I’d find when I pulled the cork. I more than half expected it to be dead. Well, it wasn’t. In fact it was fine: mature and claret-like, very drinkable and enjoyable. Just goes to show: Some high-end wines can’t cut the mustard, while some simple ones age beautifully. It depends more on the combination of grape, vintage, and maker than any simple formula. For our 43rd anniversary, Diane and I dug out our oldest bottle of wine. Even though 43 is a high number as anniversaries go, it’s not a significant one – but there are no guarantees that we or the bottle would get any older, and almost certainly we, at least, won’t get any better. 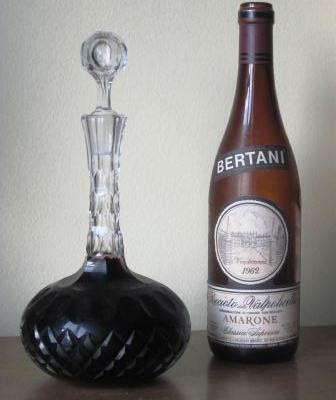 So I pulled the cork – very carefully – on my last bottle of 1962 Bertani Amarone. No point beating around the bush: The wine was spectacular. 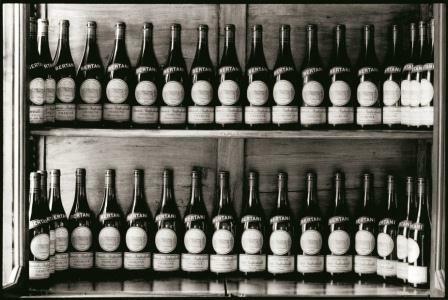 1962 was close to Bertani’s first commercial release of Recioto di Valpolicella Amarone, as it was then known. Their very first was 1959, which may well be the first commercial release of Amarone, period. The wine was a rarity then, the result of a strain of super-heroic yeasts that could handle the high sugar levels of grapes that normally made the sweet Recioto di Valpolicella and convert them to the high alcohol levels of a fully dry Amarone – 15% in the case of our bottle of ‘62. That conversion, by the way, is where the name Amarone comes from: The wine was once thought of as a freakishly bitter version (amaro, in Italian) of the Verona area’s traditional Recioto. That sweet wine is still made, and it’s still lovely and much beloved in and around Verona – but in terms of serious wine quality and complexity, it isn’t a patch on Amarone. In the decades since 1962, Amarone has become an important wine in volume and reputation, with the inevitable result that only a handful of the many wines now on the market that bear the Amarone label carry on the tradition of true Amarone. 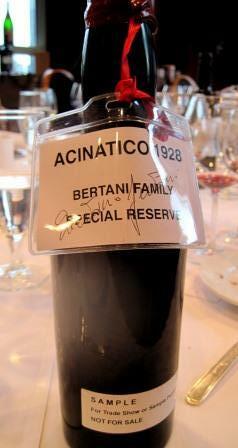 By the way, Bertani continues to market older vintages; some back to 1960 are still commercially available. For my palate, the real Amarone is one of the world’s greatest wines – period, no qualifications. Vinified from carefully selected, patiently-dried-until-they-are-half-raisined bunches of the same traditional-to-Verona varieties that make Valpolicella (Corvina, Rondinella, and – less and less – Molinara), Amarone ferments on its skins slowly, slowly over the winter, the process usually only finishing around Easter. That produces a wine extraordinarily rich in extract and high in alcohol, with velvety tannins and generous acidity and mouthfuls of fruit, a wine with the structure to last for decades and the abundance of flavors to clothe that structure with alluring and steadily evolving flavors. Though all of 50 years old, it had the color of a young Barolo – deep garnet shading to an orange edge – and a panoply of flavors running from youthful fruit to mature and earthy minerality. This bottle just blew away the dinner we’d built around it. We drank Veuve Clicquot brut with our first course, a truffle omelet made with some jarred black truffles I’d purchased in Alba back in May (privileged beyond belief, Alba gets black spring and summer truffles, too, in addition to its more famous white ones). For our main course we were trying Scottish grouse, a variety of game bird we’d never tasted before, and we made a classic French preparation for them out of a usually reliable Raymond Oliver cookbook. Alas, this was a total failure – not Oliver’s recipe, but the birds themselves. Grouse, it turns out, taste of heather and resin, flavors that could not be rescued even by Oliver’s interesting bread sauce. I’m not sure what you could do with grouse to make them palatable (to me, at least), so I guess in the future I’ll stick to partridge and pheasant and – if I could ever get them again – woodcock. Diane has written in greater detail about this dinner: connect here. 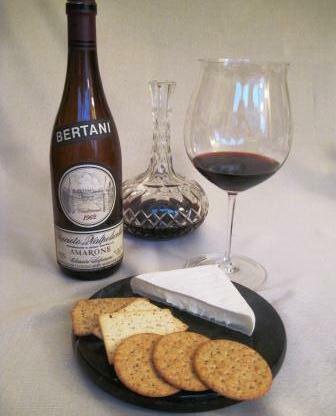 Despite the bizarre flavors of the grouse, the Bertani was lovely: rich, deep, and still youthful tasting, with a flavor that challenges my 30+ years of wine writing experience to describe – black cherry fruit, to be sure, and tobacco, with rich mushroomy/earthy flavors as well. But that’s far from all. Complex is the inadequate shorthand for it. With cheese – a wonderfully runny Robiolo Bosola – the wine changed in a totally unexpected direction. Usually cheese brings up a wine’s fruit. In this case, our cheese evoked the Amarone’s mature, evolved flavors, very seriously deepening its already great complexity – and putting even more strain on my supply of adjectives. I can’t parse fruit flavors and herbal notes to the fineness that many of my wine-writing brethren and sistren can (for example, do you know what cloudberries taste like? ), so I’m really up against my limitations here in trying to convey the myriad facets of this wine. Even after the cheese, as we sipped the last of the Amarone by itself, it kept getting more intriguing and less susceptible of description. I can’t give you an approximation of it, because it was more than any of its identifiable parts: The whole was simply elegant and profound, unquestionably one of the greatest wines I have ever drunk. It was as intellectually challenging as it was sensually satisfying. The main course may have been a disappointment, but the main wine more than made up for it. I acquired this wine about ten years ago, and it has lived since in my less-than-optimum storage conditions – but then, so have I. Gives a whole other dimension to “wine is a living thing,” doesn’t it? One of the advantages of living in New York is that you don’t always have to travel to the wine country to taste wines or interview producers; often enough they come here, bringing with them a range of wines for tasting and talking about. 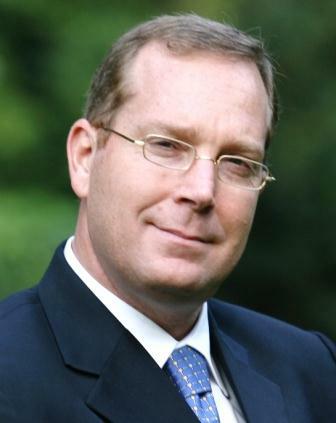 Recently, Andrea Sartori was in town. He is the fourth generation of the Sartori Amarone family, which by itself was enough to catch my interest (regular readers will already know my veneration of Amarone) – but what made the visit even more interesting was that traveling with him was his enologist, Franco Bernabei, one of the most respected practitioners of that exacting craft in Italy. 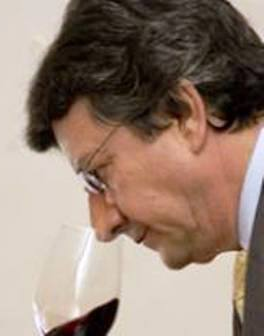 His being here was unusual because, as Andrea aptly put it, Franco is the very opposite of a “flying enologist.” He restricts his practice to Italy and his clients to a small number in the key zones. 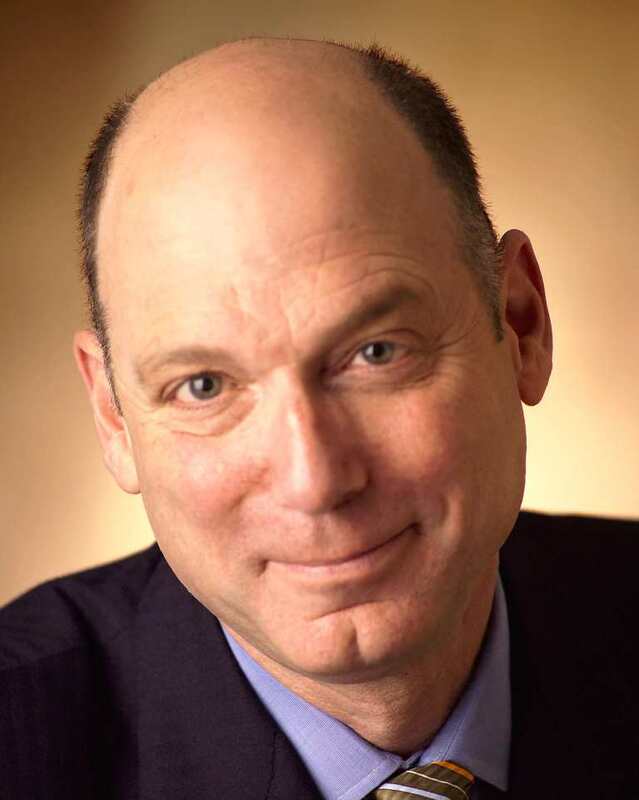 To each of these he devotes generous time and attention, years of experience and expertise, and a passion for wine that has never flagged in all the decades I’ve known him. For those of us outside Italy, his reputation probably rests most firmly on his work in Tuscany, but he was born and grew up in the Veneto, so has felt very comfortable working with the Verona-based Sartori family for the past ten years. Bernabei is a firm believer in the importance of terroir, but even more fundamentally he believes in the crucial importance of matching the right grape to the right soil. To that end, one of the first things he did, on assuming control of Sartori’s winemaking, was to spend a lot of his time (and Sartori’s euros) making a complete study of all the vineyards. About ten years ago, Andrea Sartori undertook a joint venture with the Cantina Colognola di Colli co-op, which gave him exclusive rights to the grapes from the members’ 5,000+ acres. The growers agreed to follow Sartori’s directions on fieldwork and cultivation, making Sartori one of the largest Veneto winemakers and giving Franco Bernabei access to a wide range of high-quality grapes. We tasted several results of his work, all impressive tweakings – ever-so-slight variants – of very traditional Veronese wines. First was 2009 Ferdi (Bianco Veronese IGT). Bernabei crafts this white wine from 100% Garganega, the grape variety of Soave, which has belonged for centuries to the hills around Verona. His tweaking consists of partially drying a portion of the grapes before fermentation. This appassimento, as it is known, is also traditional to those hills – but it’s usually reserved for red grapes. The process, combined with long lees contact, produces a white wine distinct from the Veronese norm – bigger, rounder, fuller-bodied, very long finishing – a real dinner wine rather than a light aperitif wine. 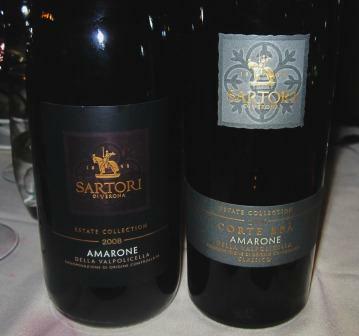 By now, we had arrived at the big guns: 2008 Amarone and 2006 Amarone Corte Bra, the latter a single-vineyard wine made only in the best vintages. 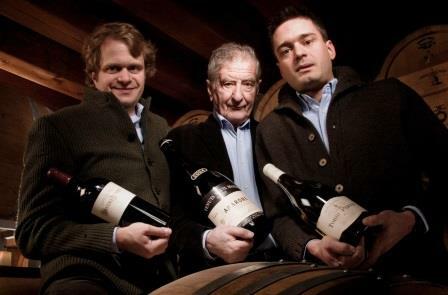 The goal, Bernabei said, was to make “a quality table wine. I hate jammy wines.” That remark, for those not familiar with the world of Amarone, damns most of the popular, relatively inexpensive Amarones now being marketed. There is nothing wishy-washy about Bernabei. 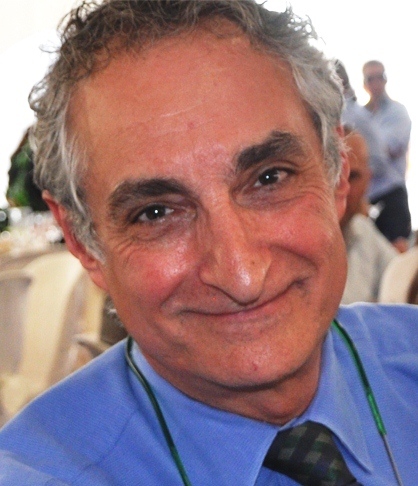 He is devoted to native Italian grapes – “the world cannot be full of Merlot,” he says – so it is worthy of note that he blends a tiny amount (5%) of Cabernet sauvignon in with the traditional grapes (Corvina, Corvinone, Rondinella) of his Amarone. I couldn’t detect it, unless its effect was in the slight zing of live tannins. But this was a very young Amarone, and some still-firm tannins are only to be expected, even in a wine as precociously big, soft, and round as this one was. The Corte Bra, two years older, tasted like classic Amarone, deep and velvety on the palate, already composed and elegant. Bernabei’s little tweak here is to out-tradition the tradition by including not Cabernet but 5% of Oseleta in the blend. Oseleta is a very old Veronese variety that had all but disappeared until some devoted growers began cultivating it and pushing its virtues. Again, I couldn’t discern it in the blend, unless it was contributing to the conspicuously attractive mouth feel of the wine. The final wine of the day was a 1995 Amarone, and here it became clear just what an enologist – or at least, what this particular enologist – adds to a wine. Regular readers know that I consider a not-quite-20-year-old Amarone as just about leaving infancy and just about ready to drink, so I was very happy indeed to see this dark-hued wine in my glass. The flavor was spot-on: big, dark fruit, with the acidity needed to keep the fruit and the abundant alcohol (all the Amarones clocked in at 15°) in equilibrium. That’s what the best Amarones do: They achieve balance on a large scale, but balance so graceful that you don’t notice the scale. A lovely wine from the pre-Bernabei days at Sartori, the ‘95 provided a great opportunity for comparison with the younger vintages, to see just what had changed. The answer was startlingly clear: the younger wines, despite being so much less evolved, tasted more elegant, more polished: sophisticated in the best sense of the word. Side by side, the ’95 – which, let me stress, I enjoyed thoroughly – tasted just a bit rustic, a bit less complete than the wines from the hand of a master. And that, I thought, is what an enologist really adds. Lesson learned.